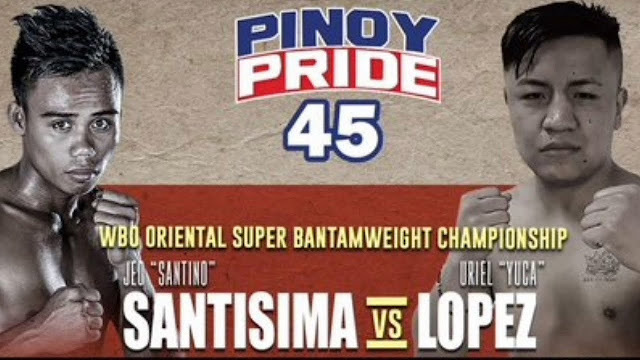 Watch the World Boxing Organisation Oriental Super Bantamweight Title fight between the champion Jeo Santisima of the Philippines and the challenger Victor Uriel Lopez of Mexico. Match happened at the IEC Convention Center, Barangay Mabolo, Cebu City, Philippines on November 24, 2018. Jeo Santisima is a 22 years old boxer with a record of 16W-2L-14KO's, world rated no. 37 in the super bantamweight division, he is a hardhitting boxer with 78% KO percentage and he won his last fight over Likit Chane via 3rd round TKO. Meanwhile, Victor Uriel Lopez is from Mexico City, Distrito Federal, Mexico who has a record of 13W-6L-1D-6KO's, world rated no. 45 in the super bantamweight division and he knocked out Antonio Tostado Garcia (22W-5L) in the 2nd round in his last fight.